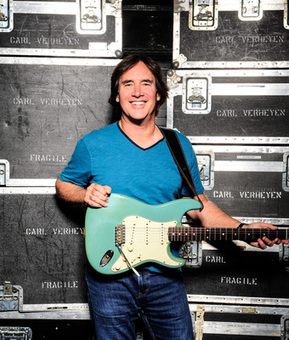 The Carl Verheyen Band’s tour will be a rare chance for audiences to experience a powerful mix of blues, rock, jazz and even country from three world-class musicians in comparatively intimate venues. The Grammy-nominated Verheyen, is joined by renowned bassist Dave Marotta, who has also performed with Phil Collins, Neil Diamond, Bruce Hornsby, Gino Vanelli, Manhattan Transfer, Kenny Loggins, and countless others. Marotta has also played bass on dozens of widely known movies and TV shows, ranging from American Idol to CSI. Ace drummer John Mader has performed or recorded with Booker T. Jones, Steve Miller, Pat Benatar, Patti Austin, Albert King, Randy Newman, and Bonnie Raitt. He has also played drums for several Tony Award-winning musicals, including Disney’s The Lion King, Rent, Mamma Mia, and the world premiere of Wicked. Verheyen provided one-on-one guitar lessons for John Fogerty and was a featured soloist at the Academy Awards, playing live to a TV audience of more than 67 million. For the past 30 years he’s performed in arenas closer to 20,000 in capacity with Supertramp. He has released 13 of his own CDs, mixing band music with solo efforts such as his 2015 recording “Alone,” a solo acoustic improvisational release. His newest recording called “The Grand Design” will be released in April of this year.